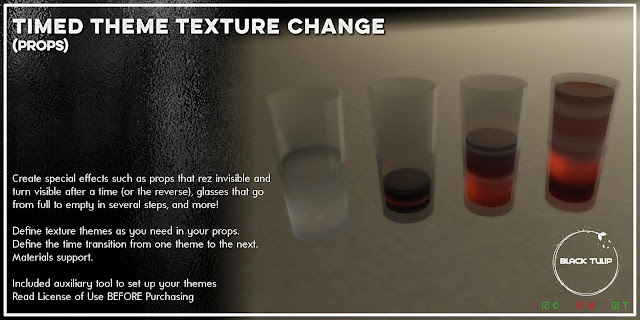 Create special effects such as props that rez invisible and turn visible after a time (or the reverse), glasses that go from full to empty in several steps, wearable food that is roasted, and more! IMPORTANT: This script is meant to work with PROPS (wearable or not). 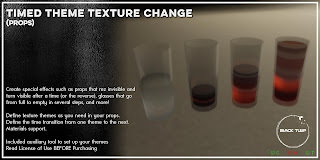 Define texture themes as you need in your props, define the time transition from one theme to the next, and you're done. The script works both with materials and non materials objects. This script is available under the (new) special license "Scripts: Attachments". You can use it in copy/transfer objects such as wearable props. Woot! Always refer to this page for the most up-to-date license. The scripts are EXCLUSIVELY to be used in the items you sell: you are responsible for any misuse.